In all our projects, we monitor whether activities are implemented, if people are participating in the activities and if these activities lead to the desired outcomes for our target groups, or in other words, if the activities generate positive change in the lives of children and adults who participate in them. Some examples of our monitoring activities in 2013 are listed below. Most of our projects funded by institutional donors include measurable indicators and sources of verification to enable the monitoring of outcomes, in which we involve the children and adults participating in our projects. In 2013, project outcomes were monitored using classroom observation tools, by collecting the test results of students in schools, and by conducting surveys to capture developments in knowledge about child protection and the use of child protection services. We also recorded referrals and follow-up activities on child protection cases, we reflected with children on progress towards their personal goals, we used resilience questionnaires to monitor psychosocial development, and we conducted numerous interviews and focus group discussions. We developed elaborate outcome monitoring tools for our innovation projects and even involved external parties in the monitoring processes. Innovation projects consist of a number of trial phases, and decisions to proceed to the next phase of the project are based on the results of thorough monitoring. 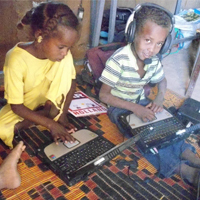 The six-week pilot of the ‘e-learning Sudan’ project involved sixty-six children in three remote villages, and a control group of twenty children was set-up in a fourth community. Children in all four locations participated in oral mathematics pre- and post-tests to assess their progress. Where possible, we integrate monitoring activities into our methodologies. The I DEAL methodology includes various monitoring tools to collect feedback from participating children. In 2013, this feedback resulted in adaptations to the I DEAL methodology, and was used in Lebanon to adapt the methodology to emergency contexts. The number of people participating in our project activities is registered in our project administration system. Consistently counting participants across country programmes remains a challenge, as does the quick collection and analysis of the data for project management purposes. In 2014, War Child will focus on improving the quality of data collected to enable open data reporting, and will spend more time on data analysis. War Child is still building its experience in outcome monitoring. One of the main challenges is finding ways to aggregate outcome-monitoring data at the organisational level to measure progress toward the organisation’s strategic objectives and learn about the effectiveness of our approaches. The quality of outcome monitoring is very dependent on the quality of planning. As indicated previously, the quality of project plans, especially those of our partner organisations, leaves room for improvement. War Child has a responsibility to support its partners in developing project plans that include clear outcome indicators that can be measured. To improve planning and monitoring, War Child has set-up a cross-organisational project approval committee that will assess the quality of new projects in 2014.